Gentle blue flowers cluster against the characteristic grey foliage of flax. Easy to grow Blooms profusely. 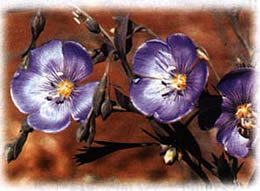 Rare, and we consider it to be the best flax. All mountain regions. 18"-2` tall.